On a recent walk of Mangerton I came across this scene at the start of my walk at the northern approach to the mountain where the trail begins that leads up to the Devils Punch Bowl. 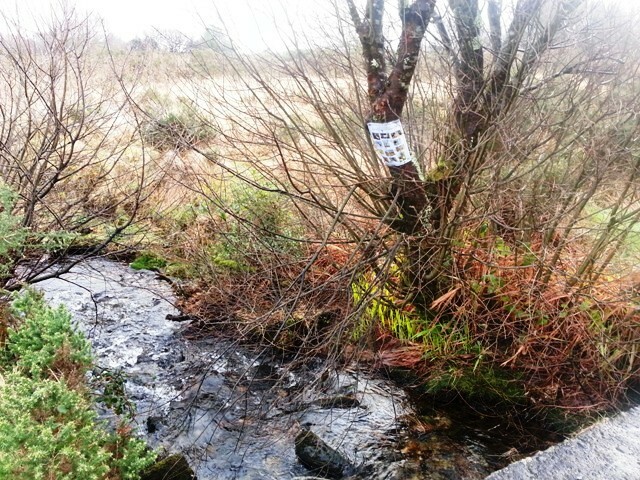 There is an A4 sheet of paper pasted to a tree overhanging the little stream. The A4 sheet of paper contains a number of images of wildlife and is an advertisement for the services of a wildlife photographer. As I put on my boots I idly wondered how the person was able to reach across the stream to stick up the poster, as an approach from behind the tree didn’t look feasible. That’s when I took in the wider picture and realised that a number of branches in front of the poster were snapped and hanging down – as if to indicate that someone had put a ladder or board across the stream and leaned on the branches to put up the poster. The poster is up too high to make standing in the stream to put it up unlikely. Now I accept there could be other explanations, and that’s why I won’t name the photographer, but is it possible that a wildlife photographer might have broken these branches in the process of advertising their wildlife photography? If not, who else might have broken them, right in front of the poster?